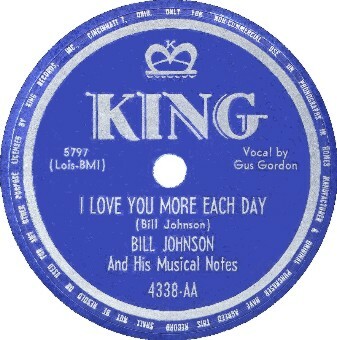 "I Love You More Each Day"/"What Can I Do"
Above: Lobby billboard of Bill Johnson And His Musical Notes, who consisted of Bill Johnson, sax; Clifton "Skeeter" Best, guitar; Egbert Victor, piano; Gus Gordon, drums; Jimmy Robinson, bass. Click HERE for an article about Bill Johnson And His Musical Notes by Marv Goldberg. BILL JOHNSON and his Musical Notes have gone so far in so short a time that they probably have a lot of other "cocktail units" wondering what the trick is. Organized only eighteen months ago, they've played some of the best jobs around the East and landed an RCA Victor recording contract. You've probably heard of several Bill Johnsons in the music business and wonder whether this is the same one who wrote Tuxedo Junction. Well, you're right. 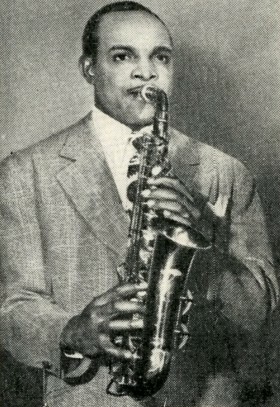 William Luther Johnson is the young man who spent more than half his career in the Erskine Hawkins band, playing the famous alto solos on Cherry, Song of the Wanderer and Bear Mash Blues and composing and arranging Swinging on Lenox Avenue, Uptown Shuffle, Wedding Blues, Dolimite and others, all on Bluebird or Victor. Born in 1913 in Georgia, Bill spent most of his youth in Florida. His father taught harmony and theory, but Bill got his education at Marquette University and the Conservatory of Wisconsin, studying harmony, arranging and piano; he'd picked up sax and clarinet at high school, too. To pay his way through college, he worked with George Abernathy's band. After two years back home in Florida, he came to New York in 1935, worked with Baron Lee's Blue Rhythm Band and Tiny Bradshaw's band for a few months each, and was with Erskine Hawkins playing lead alto from 1936 until 1943. Tuxedo Junction started out as a sax riff which he and the tenor man, Julian Dash, contributed when an extra side was needed on a record date. In 1943 and '44 Bill wrote arrangements for Boyd Raeburn, Lucky Millinder and Vincent Lopez. Then he toured the South Pacific for ten months from Australia to Okinawa as a member of Snub Mosely's band. While on the tour he conceived the idea of forming a small unit in which every man could sing part-harmony as well as playing an instrument. Very few groups have done this successfully. 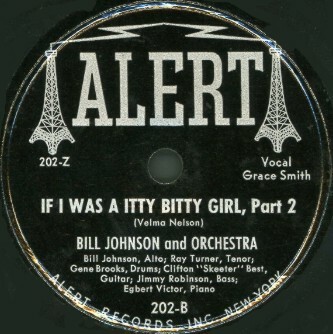 Bill still has the same men he started out with late in 1945-Egbert Victor, piano; Clifton Best, guitar; Jimmy Robinson, bass; and Gus Gordon, drums and solo vocals. The Musical Notes started with a three-month USO tour, then played a Long Island Country Club and have since played every kind of spot from Minton's in Harlem to the Down Beat on 52nd Street. Their RCA Victor records, such as Don't You Think I Ought to Know and Pretty Eyed Baby (a Mary Lou Williams tune), have been doing very nicely. And Bill, who writes a lot of the tunes and all the arrangements himself, is doing very nicely indeed. Above: Label image for King 4338-AA recorded about October 1949 and released in December 1949. At the time of this session, baritone/pianist Lonnie Slappey replaced Egbert Victor. Also, saxaphonist/clarinetist Ben Kinyard was brought in for this session. 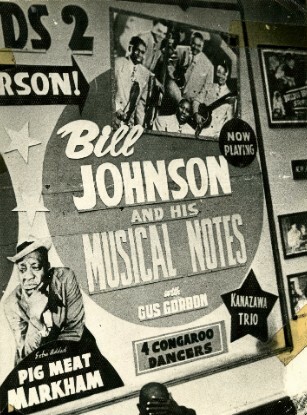 CLICK HERE FOR "THE BILL JOHNSON AND HIS MUSICAL NOTES WEB PAGE".